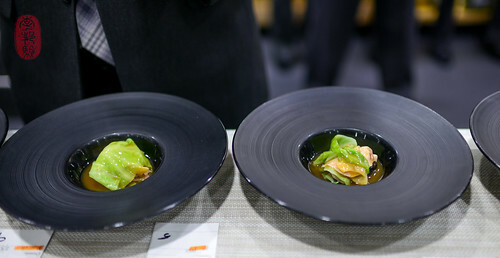 Corey Lee, chef of the 3 Michelin-starred Benu, showed up looking like a sifu, and knocked my socks off with ham and black truffles wrapped in cabbage and glazed in a thick, gelatinous stew of fish maw. 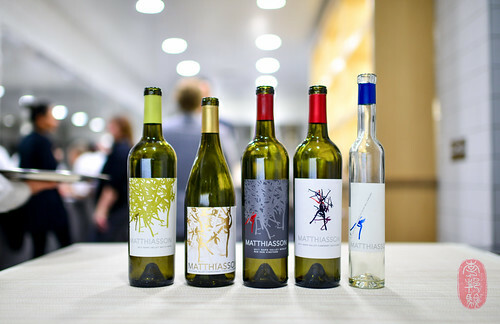 This happened when Lee cooked with chef Christopher Kostow on the ninth day of the Twelve Days of Christmas at the Restaurant at Meadowood, with wines paired by Matthiasson. Corey Lee’s cooking explores Asian ingredients and flavors on a classically European platform. My two meals at Benu (my last one was in December of 2012) have been flawless. 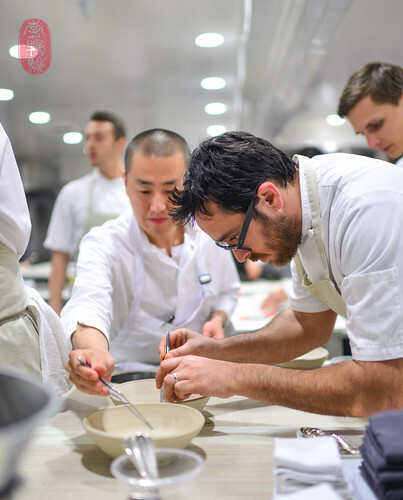 Corey Lee, who was the chef de cuisine of The French Laundry for more than half a decade (he was the chef when I first ate there in 2006), is a technician. It shows in his food at Benu, which has been unimpeachable in my limited experience. Fish and meat were cooked perfectly. Flavors were pure. 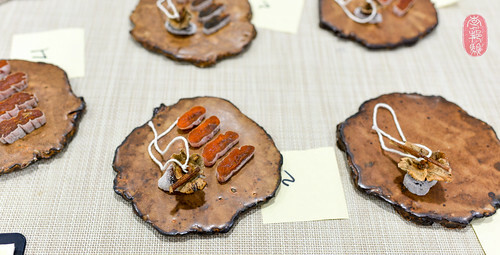 And his plating was particularly clean and concise, marked by sharp lines and tight corners. Whether perceived, or actual, I found his cooking at the Twelve Days of Christmas a little less rigorous, and a little more fluid. It wasn’t sloppy by any means, but it felt more relaxed, more comforting, and more familiar. And I absolutely loved it. That ham and cabbage dish, with tender bits of fish maw melting into the glistening sauce, was unspeakably delicious, and rang the bells of nostalgia for me. That warm coupling of ham and cabbage was a reminder of childhood soups, and the many similar dishes I’ve had in Hong Kong that have left my lips sticky with gelatin (cabbage, ham, and fish maw are favored Cantonese ingredients). For me, it was the highlight of this dinner. I know that rice and matsutake mushrooms make a well-known pair in Japanese cuisine. But I can’t help to think that there was an inside joke among this year’s chefs about matsutake porridge. Or maybe I missed the memo, or that conversation? Or maybe I’m just making it up. On night seven, Christopher Kostow served a warm samp (a type of grits) and squid porridge with thinly shaved matsutake mushrooms and pine. 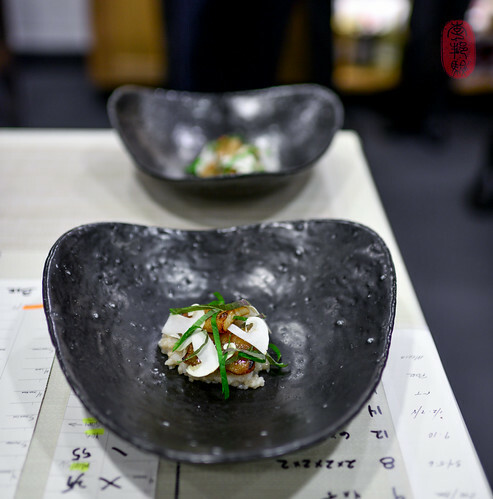 On night eight, Grant Achatz served a warm tapioca pearl and abalone porridge with thinly shaved matsutake mushrooms and pine. And on this night, Corey Lee served a warm rice dish (it was a blend of different rice varieties) with grilled eel, thinly sliced matsutake mushrooms, and julienne strips of sesame leaf. The rice was soft, warm, and inviting. I loved it. Two of my favorite canapés from this year’s Twelve Days of Christmas appeared this night. At the reception, Christopher Kostow presented spiny lobster toast (think shrimp toast, but with lobster instead). Those were buttery and delicious. I think there is some truth to the generalization that (East) Asian cultures shy away from sweetness. Most of the sweetness that I encountered as a child at home (outside of my American diet, that is) was fruit-based. Otherwise, my parents had very little use for refined sugar. My parents would have approved of Corey Lee’s desserts. I certainly did. First, he served Fuyu persimmons, which had been hung to dry for 56 days. They had shriveled and bloomed a beautiful coat of dusty sugar. The interior was dense and sweet, and still very much tender and moist. The persimmons were simply sliced and presented on a plate with the stem and tie string attached. For the main dessert, Lee presented a milky, mellow-sweet combination of almond ice cream and white chocolate wrapped in yuba. The overlap in flavor between the almond milk and soy milk (in the yuba) was eye-opening. Where the flavor of one began and the other ended, I could not tell. This was an extraordinary end to a very thoughtfully planned menu. This dinner with Corey Lee and Christopher Kostow was steady and consistent in a way that few others were. There was something soothing about the progression of the courses, a seamlessness to the transitions, and a quieting comfort about the food. Perhaps more than any other dinner this year, I felt that this one saw the closest meeting of the minds between two chefs. Just like the flavors in that almond-yuba dessert, I couldn’t readily tell where one began and the other ended. Panko, pine syrup, orange salt. Cabbage, baked ham, black truffle. 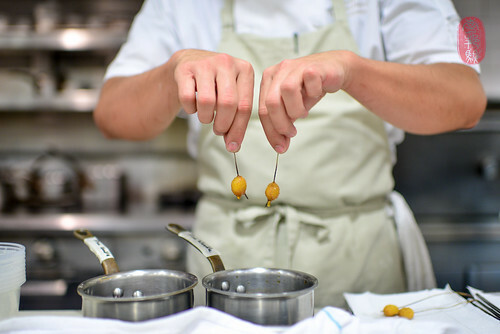 Below are links to my posts and photos from all of the Twelve Days of Christmas dinners I have attended over the past three years at the Restaurant at Meadowood. Each chef is listed with the restaurant with which they were cooking at the time they participated in the event (some have moved on to other projects and restaurants). ~ by ulterior epicure on December 28, 2014.